A census of ornate box turtles will help researchers determine the turtles’ status in Illinois. 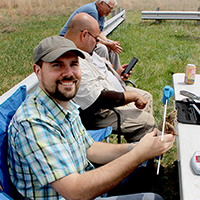 Devin Edmonds is a graduate student in the Illinois Natural History Survey and the department of natural resources and environmental sciences at the U. of I.
OGLE COUNTY, Ill. – Searching for reptiles and amphibians is often quite tedious. You have to carefully scan ahead of each step for movement before a snake gets away, or spend hours flipping over logs to find the particular salamander you are looking for. Today, we’re searching for turtles. 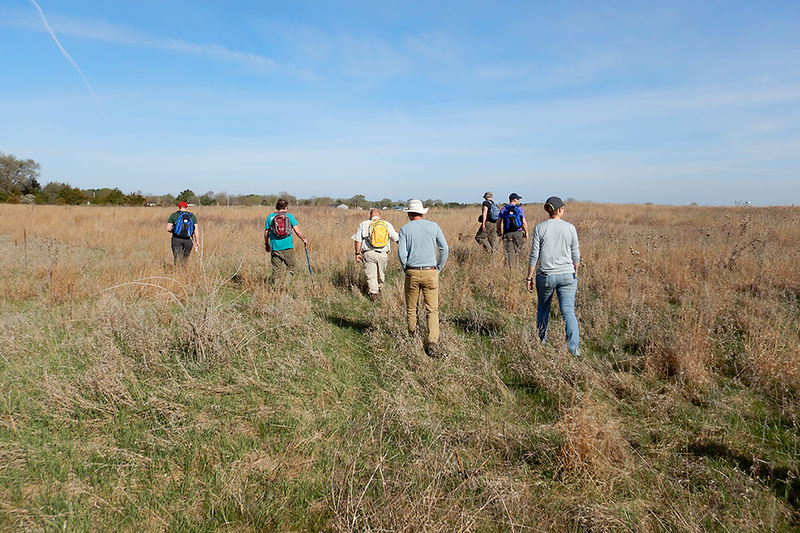 We’re surveying two of the largest known ornate box turtle sites in Illinois with the goal of finding, measuring and marking as many as possible. With enough recaptures, we can calculate how likely it is for an individual turtle to survive from one year to the next and determine population size. This helps us understand whether the turtle population is stable, increasing or decreasing in size. The numbers tell us whether the turtle population is at risk of extinction. Searching for turtles in tall grass is slow work for humans alone. 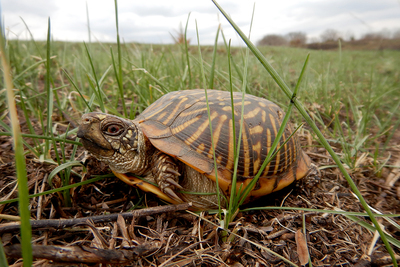 Historically, the ornate box turtle was found in 45 Illinois counties. Today, you can count on two hands the number of counties with recently confirmed populations. This decline landed the species on the Illinois state list of threatened species in 2009, with habitat loss and road mortality being the greatest threats to its continued survival. The team searched for ornate box turtles, like this specimen found in Ogle County, Illinois. Fortunately, John Rucker and his Boykin spaniels are helping us find the turtles. The spaniels are working dogs, not pets. Rucker discovered his dogs’ special talent when one brought him a box turtle in its mouth. Today, his team of dogs helps biologists find these once-common but increasingly rare chelonians for study. As we walk through the knee-high grass, the dogs carry on ahead of us, their noses to the ground, brown bodies nearly concealed. Whenever a dog finds a turtle, it picks it up in its mouth and carries it to John like a precious toy. The dog won’t let anyone else take the turtle out of its mouth. 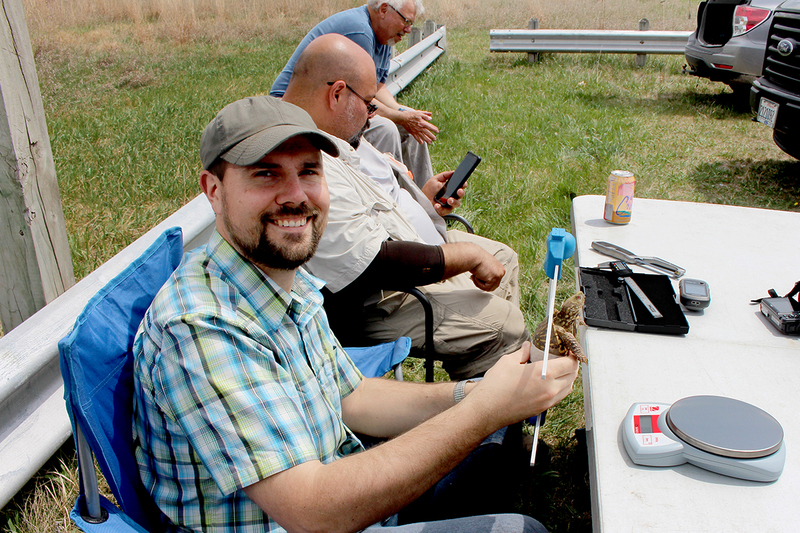 John praises the dog and then hands the turtle to one of us so we can begin recording data. 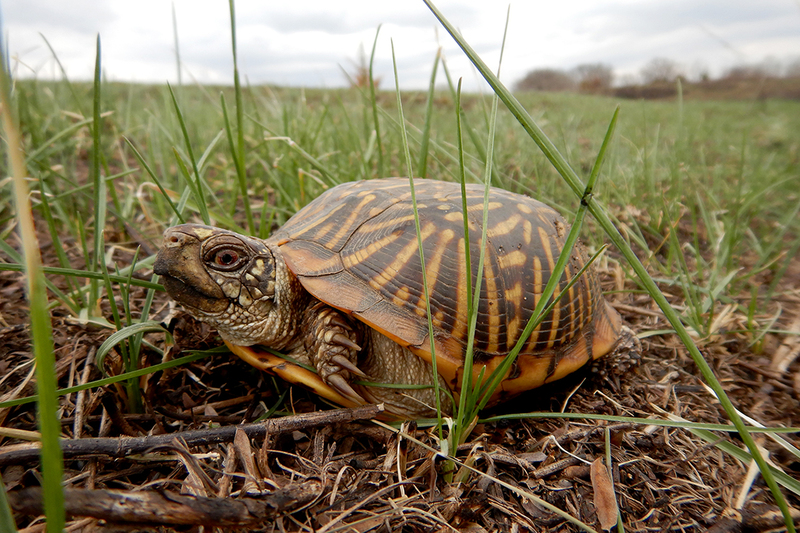 See video to learn more about U. of I. research on box turtles and the use of Boykin spaniels. To keep track of individual turtles, we notch the shells, cutting little pieces out of the sections of shell, called scutes, that border the outer edge. This allows us to assign each turtle a unique identification code. The scutes are numbered from one to 12 on left and right sides. By notching different combinations of scutes on each side of the shell, we can potentially identify thousands of individual turtles. The notches don’t harm the animals, and when done properly, stay with the turtle for the rest of its life. 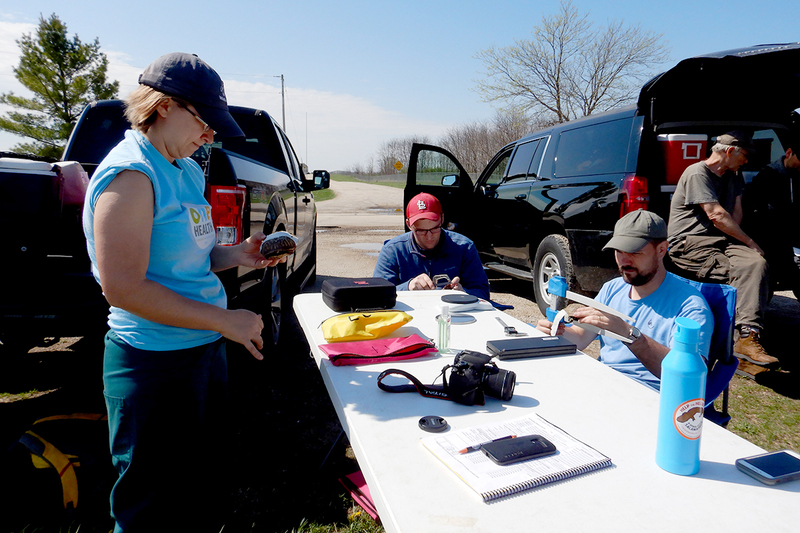 With the help of turtle dogs, researchers found 170 turtles at two sites in Illinois. 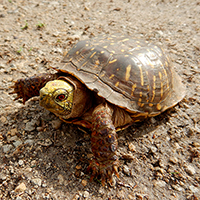 Mortality events linked to disease outbreaks have been documented in the closely related eastern box turtle, and there is concern that the ornate box turtle is also at risk. While we mark and measure the turtles, U. of I. veterinary clinical medicine professor Dr. Matt Allender and students in the Wildlife Epidemiology Lab give each turtle a physical exam, drawing blood and swabbing the mouth and cloaca to screen for diseases and monitor health. 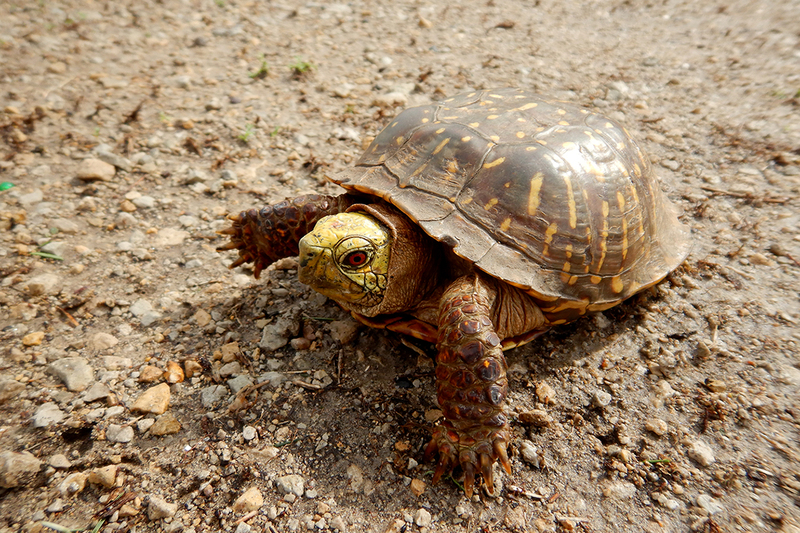 The work is providing a baseline for future studies of box turtle health. Veterinarians and students draw blood and swab the turtles to screen for diseases and monitor the turtles’ health. With the help of the turtle dogs, we find more than 100 turtles at the first site and nearly 70 at the second. Several turtles already have notches and were originally marked by the Illinois Department of Natural Resources in 1988. These turtles are nearly 30 years old, approaching the maximum known lifespan for the species. We expect this work will guide conservation efforts for the ornate box turtle in Illinois and help ensure its continued survival. Subscribe to Behind the Scenes for short blog posts, photos and videos from Illinois faculty, researchers, students and staff about their work and lives. Send an email with “SUBSCRIBE BTS” in the subject line.